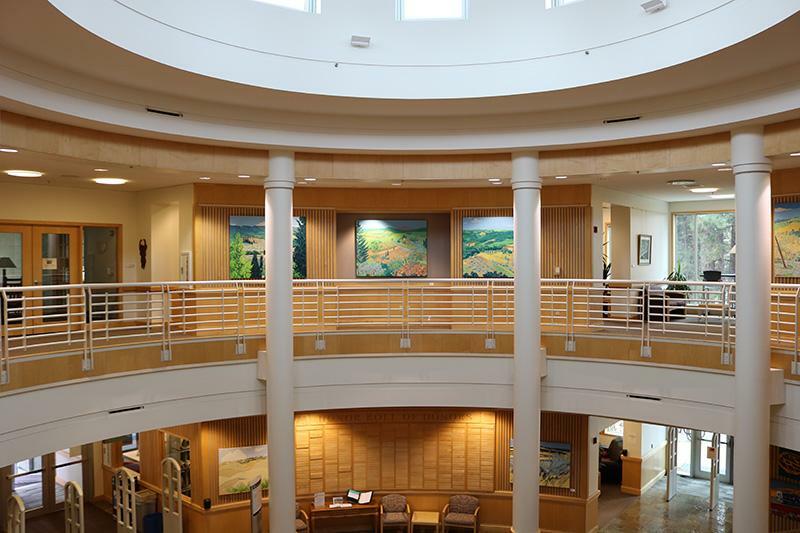 The Rotunda Gallery is the main lobby of the Barber Library in Bend. 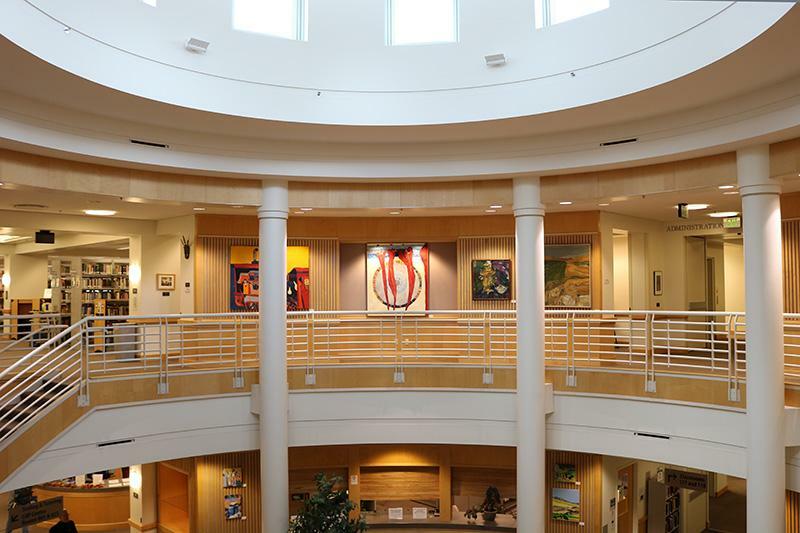 Two stories tall, with an abundance of floor space and natural light, the Rotunda is an ideal location for College and community exhibits and events. An open tile floor for standing exhibits. Two stories of wall space for hanging exhibits. Two built-in glass display cases for small-to-medium pieces. 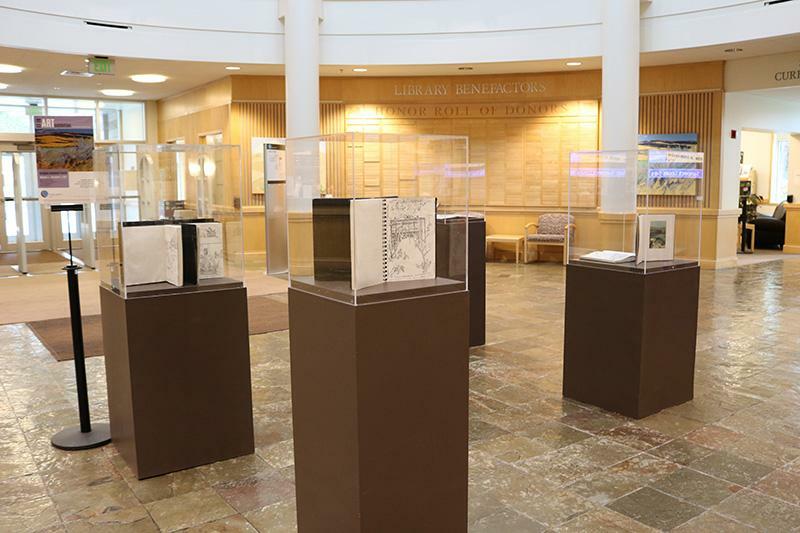 Barber Library encourages proposals for exhibits that have intellectual and aesthetic appeal to COCC students, faculty, and community members. Rotating exhibits must have a specific start and end date. Generally, Rotunda exhibits are displayed for about two months or one academic quarter. All sales inquiries are directed to the artists. The Library does not collect any commissions. 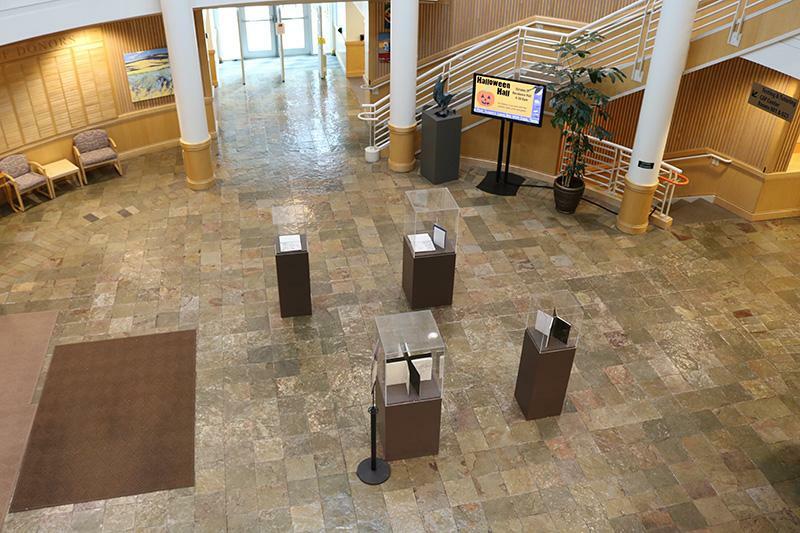 The Library promotes each exhibit on the COCC website and social media accounts. Further promotion is the responsibility of the artist(s). Exhibits are located in high traffic and secured areas in the Rotunda to reduce the likelihood of damage or theft of materials. However, the Library takes no responsibility for the security or welfare of exhibits at any time, including during transport, installation, or dismantling. Exhibits will be placed with consideration for public safety and disability access. 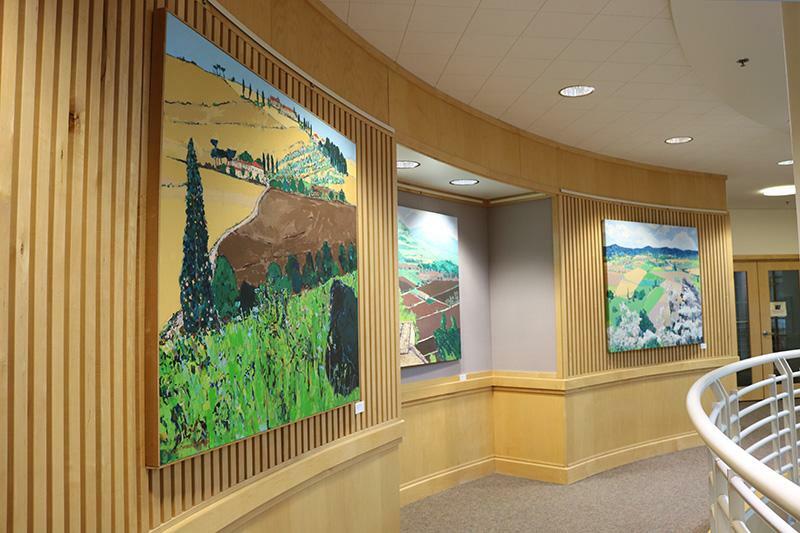 To request an application to hold an exhibit in the Rotunda Gallery, contact Mary Beth Hamilton. This typewriter collection, displayed on the main floor Reading Room, represents a portion of Mr. Joe.M. Updegraff's collection. Mr. Updegraff was an instructor at Central Oregon Community College from 1966 to 1967. He acquired his first machine in 1941 when a student of his gave him an 1892 Smith-Premier #2 that had been found on a scap heap. Until the time of his death in 1968, he had collected and restored over 250 machines from all over the United States, making it then the largest known private collection. The collector was a serious student of the history of the typewriter and had a large collection of references on this subject. 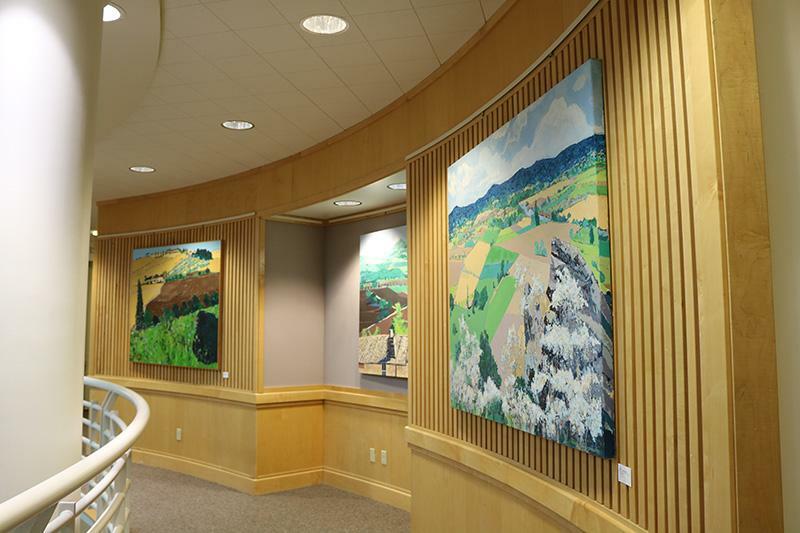 Every year, Barber Library purchases artwork by COCC students with the generous help of the Faculty Forum. Student photographs, paintings, and sculptures can be seen on display on both the first and second floors.